On Saturday December 5, 2015 at 2 PM the Hilo Community Chorus will present Joseph Martin’s “Ceremony of Candles” and Benjamin Britten’s “Ceremony of Carols” at the First United Protestant Church, 1350 Waianuenue Ave, Hilo, HI, 96720. 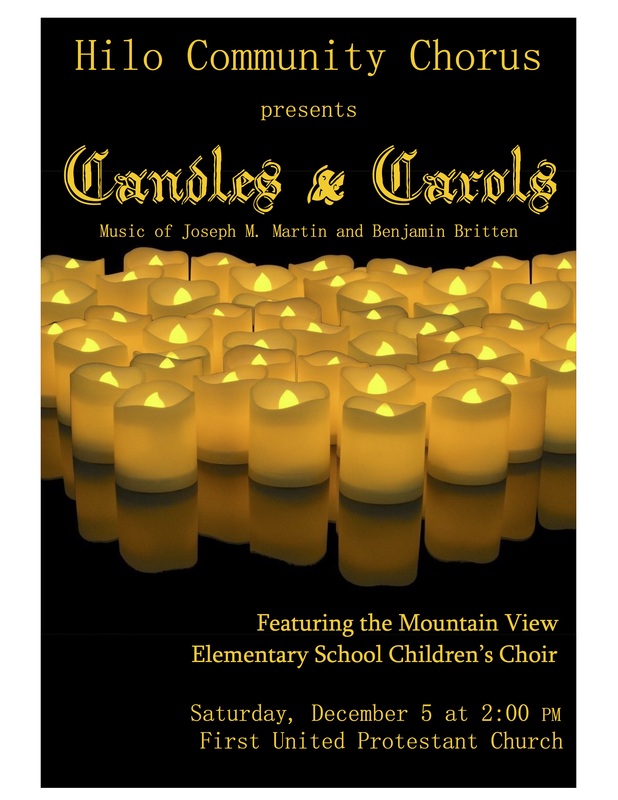 Mountain View Elementary Children’s Choir, under the direction of Jennifer Tsuji, will be featured guests. Joseph Martin’s imaginative new work “Ceremony of Candles” uses carols and candlelight to embody the hope of Christ. Featuring orchestration by Brant Adams and narration by Pamela Martin, carols featured include: In the Bleak Midwinter • Silent Night • O Come Little Children • What Child is This? • O Little Town of Bethlehem • and many others. “A Ceremony of Carols, Op. 28”, is a choral piece by Benjamin Britten, scored for chorus, solo voices, and harp. Written for Christmas, it consists of eleven movements, with text from The English Galaxy of Shorter Poems, edited by Gerald Bullett. It is sung in Middle English, and will include accompaniment by harpist Tatyana Shapiro Leiste.